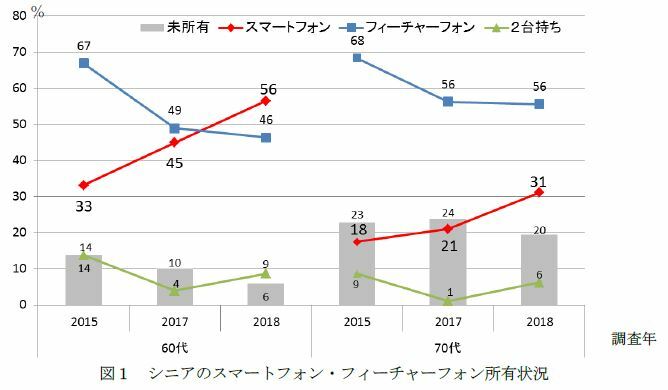 NTT Docomo Mobile Society Research Institute reported that Smart phone ownership among 60’s in Japan exceeds 50%, outnumbering feature phone for the first time, in the survey targeting senior users in January 2018. Among 70’s, the share reaches 31%. 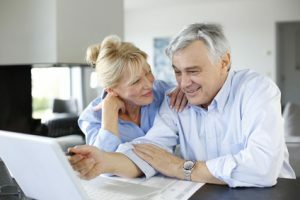 Smart phone ownership among 60’s has risen from 33% in 2015 to 45% in 2017 and to 56% in 2018. The growth rate among 70’s is 10 points in 2018 on a year on year basis. The reduction rate of feature phone ownership is slight both among 60’s and 70’s. Regarding ICT device ownership including PC, smart phone ownership is roughly up 20% both among 60’s and 70’s, Among 60’s, the ratio of users owning both for smart phone and PC is 36%. Among 70’s, the ratios of around 20% can be found in smart phone & PC, feature phone & PC and feature phone only. Among 60’s females, smart phone owners are up 30%, and the ratio of users owning both smart phone and PC is 37%. Among 70’s female, feature phone ownership is predominately 70%, out of which the ratio of feature pone only is 46%. The ratios of seniors without any ICT devices are 18% among males and 20% among females, which are almost unchanged from 2015.